Since 1998, Unirac has been manufacturing all aluminum and stainless steel mounting systems for photovoltaic systems. Abundant Solar uses the Solarmount racking system for 90% of our rooftop and ground-mount systems. Engineered for 120 mph wind loads, the Solarmount system holds your solar system securely for years into the future. Their standoff system provides an easy flashing system using standard pipe jacks to seal roof penetrations on new construction roofs. New Mexico based Direct Power and Water makes the best top of pole mounts in the indu stry. Abundant Solar relies on these high quality custom mounts for all of our top of pole mounts. Most are rated for 90+mph wind loads, and are easily adjustable to match seasonal sun angles. 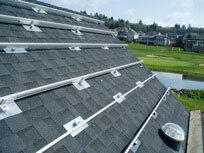 Quick Mount PV™ is a waterproof anchor for attaching solar panels to a roof. Abundant Solar uses Quickmounts whenever we install to an existing roof. We are committed to installing flashing systems for all penetrations on your roof. Quickmount is the best solution for an existing composition roof that we have found.